Today I was going to share Drunken Gummy Bears with all of you. Unfortunately, this recipe was a fail. 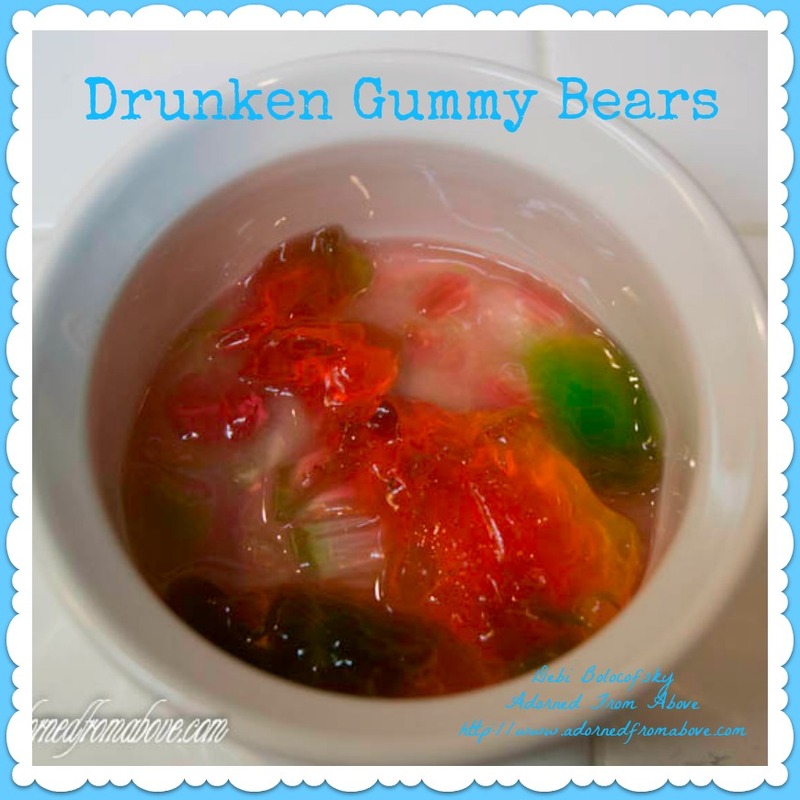 I found several blogs online that had Gummy Bears soaked in vodka. I followed the directions, but they really just turned into a huge blob in the vodka. I also didn't really love the taste. They really had a strong vodka taste, rather then the vodka tasting like gummy bears. I was sad that they weren't as good at the jelly bean infused vodka. I am going to share the recipe with all of you, and you may want to do some research also, maybe you can make a better batch then I did. 1. Put the gummy bears in a jar. I used a one pint mason jar. 2. Pour the vodka over the gummy bears. 3. Let sit for 2 to 3 weeks. 5. After week 3 they were a little more separate, but still tasted pretty strong. They may be more like jello shots then anything else, but they are very loose and liquidy. Sorry, that I don't have something better for you today. Next week I will make sure to have a great Happy Hour Cocktail. Skittles vodka turns out great. After you let it soak for about a week, strain out the skittles and you have fruity/sugary vodka. Fun for summer cocktails. 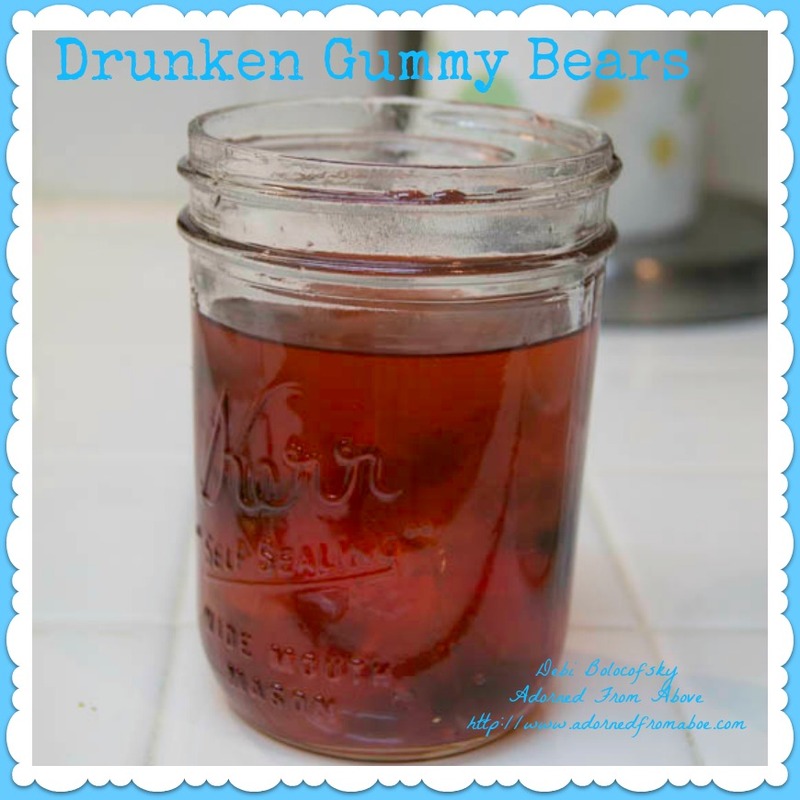 Drunken gummies work much better with rum, and you only soak them for a day or two at most. (You generally don't make them to infuse into the rum, but get the rum to soak into the gummy whatever you're using-I've had it done with gummy worms.) But they are very, very, very strong when you do them that way-think a bite sized Jello shot. The reason they did that is because you didn't refrigerate them. You must keep them in fridge. Also, Kettle One is a horrible quality vodka whereas you want to use good quality to avoid the sting. Hi! Found you on Ducks 'n a Row link up. I have made these before using gummy worms for a halloween party. I used a flavored vodka, maybe fruit punch or something and soaked them just for a few hours and then the gummy worms tasted pretty good. They weren't amazing, but they were good. Now following you on G+. Thank you so much for sharing at last week's All My Bloggy Friends :) I can't wait to see what you share this week!